Race: The major racial groups are Caucasian (72%), African-American (13%), and Asian (5%) (2010 census). Religion: Christianity is the predominant religion, with Protestants and Roman Catholics accounting for 51% and 24% of the adult population respectively. Languages: English is the predominant language for government, business, society and education and the official language in over half of the states. Founding Date: The official date for the birth of the United States of America is 4 July 1776. Administration: The US is a federal republic consisting of 50 states and Washington D.C., the national capital, as well as several territories under US jurisdiction. School education spans 12 grades. Students spend from 5 to 8 years in elementary education, followed by 4 to 7 years of secondary education. They have to meet credit and exit examination requirements prescribed by the state education authorities in order to graduate and receive the High School Diploma. Higher education institutions in the US award certificates, diplomas and degrees from the associate to doctoral levels. Associate degrees such as Associate of Arts and Associate of Science are 2-year programs following a high school diploma. Bachelor’s degree, also called a baccalaureate degree, involves 4 years of fulltime study after high school. The term post-baccalaureate credential is sometimes used to describe programs completed after a bachelor’s degree. First professional degrees in fields such as law, medicine, dentistry and pharmacy involve at least 3 years of fulltime study, with entry based on a bachelor’s degree or undergraduate study in required subjects. Though they use the term “doctor” in the title, such as Juris Doctor, Doctor of Medicine, Doctor of Dental Surgery, and Doctor of Pharmacy, they are not advanced doctoral degrees but entry-level qualifications for obtaining licensure in certain professions. Master’s degrees such as Master of Arts and Master of Science involve 1 to 2 years of fulltime study following a bachelor’s degree. Doctor of Philosophy (PhD) and other research doctorates involve 4 or more years of fulltime study following a master’s degree in a related field or 5 or more years following a bachelor’s degree. Vocational and technical education, called career and technical education (CTE) in the US, prepares students for entry-level jobs in occupations requiring less than a bachelor’s degree. Typical CTE programs include certificates, diplomas and associate degrees, with entry based on the high school diploma. Associate degrees such as Associate of Applied Arts and Associate of Applied Science involve 2 years of fulltime study and allow graduates to enter certain professions such as engineering technology, dental hygiene, and nursing. The US has over 4,000 degree-granting institutions awarding 3 million degrees of various levels each year. Accreditation status largely determines whether credits and credentials completed at one institution are accepted by other institutions, licensing bodies, and government agencies. Accreditation may apply to an institution (institutional accreditation) or a specific program of study (programmatic accreditation). Both the US Department of Education (USDE) and Council for Higher Education Accreditation (CHEA) conduct periodic reviews and publish updated lists of accrediting agencies they recognize. In addition to the regional accreditors, many national faith-related accreditors, career-related accreditors, and programmatic accreditors are recognized by either USDE or CHEA or both. High School Diploma Completion of Grade 8 4 years Generally compares to the completion of a High School Diploma. Associate Degree High School Diploma 2 years Generally compares to the completion of a post-secondary Diploma. Bachelor’s Degree High School Diploma 4-5 years Generally compares to the completion of a four-year Bachelor’s degree. Bachelor’s Degree in Education High School Diploma 4 years Generally compares to the completion of a four-year Bachelor of Education degree. Juris Doctor Bachelor’s degree 3 years Generally compares to the completion of a first professional university degree in law. Doctor of Medicine At least three years of pre-professional undergraduate study 4 years Generally compares to the completion of a first professional university degree in medicine. Doctor of Dental Surgery / Doctor of Dental Medicine At least three years of pre-professional undergraduate study 4 years Generally compares to the completion of a first professional university degree in dentistry. Doctor of Veterinary Medicine At least two years of pre-professional undergraduate study 4 years Generally compares to the completion of a first professional university degree in veterinary medicine. Master’s Degree Bachelor’s degree 1-2 years Generally compares to the completion of a Master’s degree. Doctor of Philosophy Master’s degree or Bachelor’s degree At least 4 years following a Master’s degree or 5 years following a Bachelor’s degree Generally compares to the completion of a Doctor of Philosophy (PhD) degree. 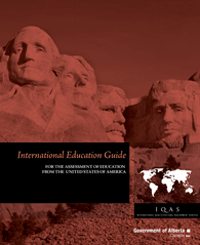 These templates give detailed information on educational credentials awarded for programs of study completed in the United States of the America.